Information about the United Brotherhood of Carpenters, the District Council, the Jobsite, the Contractor Associations, the Signatory Contractors, and CCA Metro. The United Brotherhood of Carpenters and Joiners of America (UBC) was founded in 1881 and represents carpenters and other workers in the U.S. and Canada. The New York City District Council of Carpenters is a part of the UBC and is comprised of 8 local unions. Geographic region and/or area of expertise are what separate the locals from one another. The District Council is made up of 8 locals: four general carpentry locals (20, 45, 157, and 926) and four specialty locals (740, 1556, 2790, and 2287). The District Council is made up of an elected Executive Secretary Treasurer (EST), a President and a Vice President. The District Council serves as the coordinating body for all 8 locals of New York City. The District Council also represents members in grievances and jurisdictional disputes. A Business Manager is the head business agent, the top representative of union carpenters in your local. Business Representatives are responsible for communicating with union construction companies about their workforce needs and call the out-of-work list to dispatch carpenters to the job sites. The Local Union Executive Board consists of a President, Vice President, Financial Secretary, Recording Secretary, Treasurer, Warden, Conductor, and three Trustees per local. Descriptions of each of these offices can be found in the UBC Constitution. Organizers are responsible for increasing the union’s market share and getting non-union companies to sign on with the union. They usually give reports at your local union meeting. They also organize picket lines against non-union contractors. District Council Delegates – each local union elects a certain number of delegates to the District Council, the number they get to elect depends on the total number of members in good standing in the local. The delegates can report to you on what happens at the delegates’ meetings, held monthly at the District Council. Superintendent– coordinates and supervises all the different trades on a site. Usually works for the general contractor or construction manager. May or may not have a union book. Foreman– supervises the work of one particular trade for one particular company. The foreman is a card-carrying union member in the trade he or she is supervising. He or she is selected by the employer and by contract is considered an agent of the employer. The foreman is paid a higher rate for doing the work of supervision. Steward– the union’s representative on the site, selected by the union. Checks to make sure all workers are union members and are current with their dues, represents workers in the case of a dispute or problem, monitors safety conditions, reports the work hours to union hall, etc. By contract the steward is the second carpenter hired and the last to be laid off, and is asked to work any time there is overtime work so that there will be a representative on site. The steward is a dedicated volunteer and therefore is not paid a higher rate for his or her responsibilities. Journey Level Carpenter– trained and competent in the trade. These carpenters are paid the full carpenter rate and are responsible for teaching the apprentices and looking out for them. Apprentice– a worker in training. Carpentry apprentices are paid a percentage of the full rate. Their rate increases on a set schedule based on the hours of work they put in and their attendance at apprentice school. The Training Center is the only organization that provides comprehensive post high school carpentry training to a large numbers of workers. Other Trades– every construction site has a number of trades working side by side. It is important to learn enough about the work of the electricians and plumbers, etc. that you can dovetail your work with theirs and keep their convenience and safety in mind. SIGNATORY CONTRACTORS are construction contractors that have signed and agreed to the terms of a collective bargaining agreement (CBA) with the New York City District Council of Carpenters. The contractors agree to pay each carpenter specific wages and benefits and abide by certain standards and the carpenters are bound by certain standards and provide the highest level of skilled craftspeople as needed. Signatory carpentry contractors provide REAL CAREERS, empowering individuals and communities with a living wage. They apply QUALITY construction practices and procedures, as well as jobsite safety principles that safeguard the members of our communities and employee carpenters alike. Signatory contractors can choose from a pool of SKILLED PROFESSIONAL CRAFTSMEN to meet specific job manning requirements. They have the ability to employ CERTIFIED APPRENTICES that attend registered New York State Department of Labor training programs. This qualifies signatory contractors to legally employ apprentices on Public Projects under mandated programs and insures a steady, skilled pool of available carpenters well into the future. The construction industry is an ever changing, technology driven business dependent upon new skills necessary to complete complex construction projects. Journey level training is available to member employees of their employees. Carpenters and their signatory contractors’ partner to produce the BEST TRAINED, HIGHEST SKILLED, MOST PRODUCTIVE WORKFORCE in the construction industry. This partnership helps contractors’ compete, stay profitable; and succeed. The Carpenter Contractor Alliance of Metropolitan New York – CCA Metro – is the leading voice on issues affecting the joint interests of 25,000 carpenters in all crafts represented by the nine local unions of the New York City District Council of Carpenters and the more than 1,000 contractors that employ these carpenters under collective bargaining agreements. 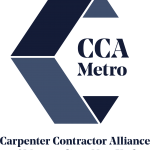 CCA Metro utilizes research and engagement with industry and community stakeholders to promote the dependable quality and safety that is delivered by trained, skilled and experienced union carpenters and contractors. We actively support investment in public building and infrastructure, private economic development and a regulatory climate favorable to growth and responsible employment and contracting policies. Our mission is simple: encourage as much employment and business opportunity as possible for union carpenters and contractors who build the best projects in New York with the highest commitment to local and diverse opportunity.